Description: This monument, standing nearly 5' tall, is made of a granite slab. 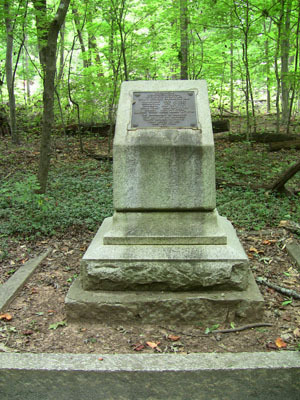 The slanted top of the monument bears a bronze plaque. Subject notes: The inscription contains 2 errors; the battle of Monmouth was fought on June 28th, rather than June 20th, and the battle of Camden occurred in 1780 instead of 1779. Henry, or Hal, Dixon was a Revolutionary War officer born in what is today Caswell County. Dixon was appointed "Inspector General over Militia" by the North Carolina legislature in 1778. Along with Jethro Sumner and Nathanael Greene, Dixon was charged with the defense of the southern states during the Revolutionary War. Location: The monument faces west. Landscape: Lies alongside the former railroad bed (today a biking path).